I’m not sure how I get the ideas for some of my cartoons, but this cartoon about how God created the world had a clear line of thought that led to its birth. I’m gonna tell you all about it. The Book of Genesis tells us how God created the world. According to Judeo-Christian tradition, the first five books of the Bible (Genesis, Exodus, Leviticus, Numbers, and Deuteronomy. Also called the Pentateuch, or the Torah) hold the actual words of God. Tradition states that they were either written by Moses through the inspiration of God, or were written by God himself and handed down to Moses together with the Ten Commandments on Mount Sinai. This means that the creation story, according to tradition, was given to us by God. 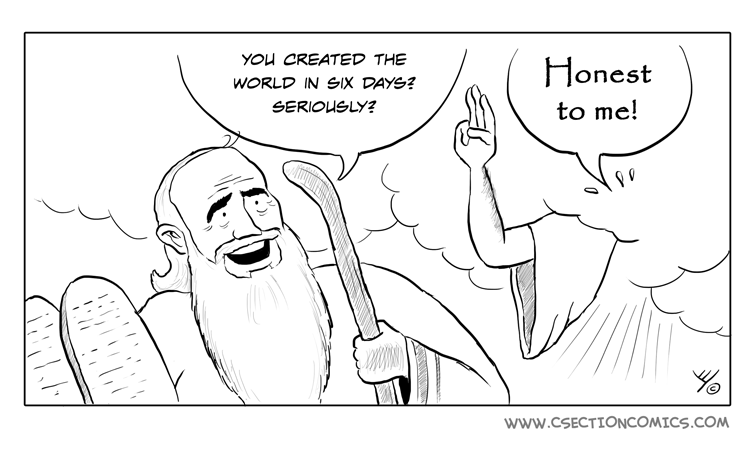 But if that’s the case, why is God telling us a story of creating the world in six days? It’s a story which is clearly so far from what science tells us today. How do we breach that gap? If you’re an Atheist, it’s easy : you claim that God doesn’t exist, and the books of Genesis, along with its “how God created the world” story is plain Bronze-age mythology. Problem solved. But I’m a cartoonist, and cartoonists let their minds wander. So let’s assume that God does exist. How come the story of creation that Our Father in Heaven gave to Moses is so far from what science tells us today? I like the term “Our Father in Heaven”, because after all, I’m a father myself. Now if my kids came to me and asked me: “Daddy, how was the world created?”, what answer would I give them? Well, it depends of course on which kid is asking: if it’s the four-year-old, she’ll get a short, simple answer, in terms she could understand. If it’s the seven-year-old, he’ll get a longer, more complex answer. But you can be sure it won’t contain the words “Quarks” or “Leptons”. If I had an eighteen-year-old, who knew some basic Math and Physics, maybe I’d slip those terms as well. My point is: you fit the story to the crowd, because you can’t expect a four-year-old to have the same level of understanding as a seven-year-old or an eighteen-year-old. And just as kids of various ages have different levels of understanding, so do human societies of different ages. Therefore, assuming that there is a God, and that God indeed gave the bible to Moses on Mount Sinai along with the secret of the world’s creation, to me it’s pretty clear he couldn’t have just start babbling about Quarks and Leptons and an expanding universe. The Big Bang Theory is hard to grasp even for ordinary modern day people, with all their education and sophistication. So what could you expect from Bronze-Age people, with no knowledge of physics or basic mathematics, who for the most part couldn’t even read? God would have to explain the creation story in terms that Moses and the rest of the Bronze-Age crowd could understand. That’s the line of thought that led to this comic. Here’s another interesting thought: If God exists, and if he reveals himself to us again, what story will he tell us? Using the logic above, the story he’d tell us would be something similar to what the Big Bang Theory suggests, because that’s what humans are capable of understanding today. But that still doesn’t mean we’re anyway near the “Truth”, and that’s the sad part: even that story is probably very far from how the universe was actually created. Just as many of us ridicule today the story of how God created the world told on Genesis, I’m sure 31st century scientists would ridicule the Big Bang theory and call it primitive. But that’s exactly the way human knowledge evolves – we make a theory that explains what we know about the world, and we find evidence to support it. But if we find evidence which contradicts our theory, we try and find a better theory which explains the world and for which there is less contradicting evidence. And part of that process is calling the ones who still believe in the older story idiots. That’s just the way science works! Holy Moses, we have more cartoons about Science. And more cartoons about Religion!